The charms of the Grand Canyon have captured the imagination of those lucky enough to experience them ever since Powell did the first recorded run down the Colorado in 1869. Marty Mathis, Vice President of Grand Canyon Expeditions, is one of those people so taken by the magic of the canyon he has made sharing the canyon his life’s work. In my previous article “Not All Outfitters are Created Equal” I talked about what makes a good outfitter. In my interview with Marty, I think you will find he has all the right answers. I was personally involved with the purchase of Grand Canyon Expeditions in fall of 1986. 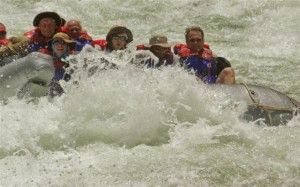 I had been rafting in the Grand for over 8 years at that time. I met a gentleman on the river…a few days into the trip he told me, “ I see your love of the Grand Canyon, I see your grand energy and your love of people!” He told me …after the trip I received post carreceivedexico and this is what it said: find a company and I would invest in you! The trip was my 50th and it was true magic. I had no idea who he was, and that he was very capable of making the purchase. I now, had all the components needed to successfully get into the river running business. I sold my house, packed a U-Haul and moved my wife, daughter (6-months) and everything I owned to Southern Utah, to become a river runner. We took over on January 1, 1987. What got you started in this career? Was there a pivotal event in your life that brought you to being an outfitter? I did my first river trip with my father in June of 1978. It was a father /son male bonding expedition. I was 21 years old and full of adventure. My father was a school teacher that had river connections. What is your background? Education? Special medical training? The National Parks Service (NPS) has specific requirement for river guide. Wilderness First Responder, CPR, Food Handlers certification and a written examination of NPS operational requirement. (e-vac, escape trails, the do\’s and do not of National Park Service). All of these are three year certifications. I have read a number of books about and been on a number of Special Interest Expeditions with study leaders with specific interest in Grand Canyon, geology, ecology and archeology. Hands on training for 33 years now and YES, I have been stuck on many a rock! What sets your company apart from others with similar offerings? Grand Canyon Expeditions (GCEX) is the 2nd largest outfitter in Grand Canyon & runs close to 100 trips/motorized expeditions per season. GCEX founder, Ron Smith, opened in 1964. GCE offers All INCLUSIVE EXPEDITIONS. All our GCEX guest need to bring is their clothing and a smile! We provide: Quality river & camping equipment. Life-jackets, river dry bags, camping gear, meals beverages except alcohol. GCEX limits our raft load to only 14 guests per raft, some company’s go to 17 plus and more! Comfort is very important to our guests and a huge part of your experience. We run the entire 277 plus miles you see the entire Grand Canyon with GCEX. A number of companies fly out at river mile 180…..missing the last 100 miles of Canyon! 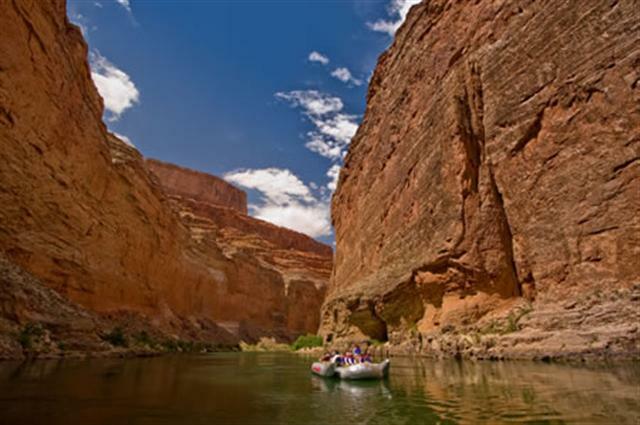 We offer special interest expeditions putting emphasis on the Canyons Natural History and Human History as well. I love all seasons for different reasons. I like the flowers in bloom (spring), I love it when the swimming holes are open (late May-September) and then there are the migratory bird\’s and the Big Horn Sheep/Mule deer in rut in the fall….. I guess I love it all! What is your funniest experience as an outfitter? One of my funniest stories was when there were three guys on the same trip named “Marty”, the elder Marty (no not me) was fishing with his son and some how during a wild fishing cast manage to get a “Repala Lure” stuck in the top of his head, through his canvas hat! I broke a rule and pulled it out with a tuft of hair & a piece of canvas hat! One of my scariest was when I thought I left a guest on the beach after scouting a rapid. I just got caught up in the moment and didn’t see he was on board, sitting very low in the front on the raft! He went on the rapid scout with me and he was just being very safe. I do however share a number of stories as long as we are on the river….I\’ve got a million of them! If you weren’t an outfitter what would you be? I have always like camping, fishing and I always have had an interest in Wilderness First Aid. I guess I was just meant for the good old outdoors! Professional Camper? What is the weather like generally? What is the best time of year to enjoy your trips? Our season is May through September. In spring it is about 80 degrees. Summer can get in the triple digits and fall goes back to a mellow 80-90 degrees. Being a mile below the rim it is cool in the evenings year round when the sun goes down. What is the local cultural experience like? The Desert Southwest, high desert @ 5,000 feet , red rocks, desert plants, cactus and the most stunning sunsets in the world as the sun sets on billion year old rock formation! The Native Americans have an incredible history in and around Grand Canyon as well ………kind of the last of the Great / Grand frontier! Is there a “special moment” on this activity that can’t be experienced elsewhere? THE ROAR OF THE RIVER and then I believe early in the morning and at sunset, the walls of the Grand Canyon change in front of your eyes. The shadows, the cracks, the overhangs and the river reflections…. it\’s really hard to explain. The song of the Grand Canyon Wren, there is only one Grand Canyon and this is where you just need to………………… Get It On You! What wildlife or interesting fauna might one see? There are a number of birds, the ravens, various hawks, California Condors, peregrine falcons and the eagles. The mule deer, Desert Big Horn Sheep, coyotes and ring tail cats just to name a few…. We hire guides from all walks of life from construction workers to wranglers. 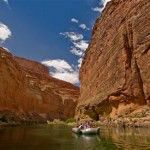 Most of our guides are from this area: Southern Utah, Flagstaff, Arizona and the Four Corners, Colorado area. Both male & female, 25 years old to 60+ years old! In what ways do you take steps to protect the environment? Recycle glass, cardboard, and aluminum cans……a whole bunch! All of GCE\’s office stationary and brochures are also recycled paper. Low emission 4-stroke outboard motors, Bio Diesel (low sulfur) and anything and everything that does have a possible future out there somewhere! Our company\’s name says it all. We are Grand Canyon Expeditions we offer 8, 14 & 16 day rafting expeditions through the entire Grand Canyon! Grand Canyon, Arizona (1-mile deep) Ha!